Apologies for late news entry. On 20th August 2012, Eromnim3 made their BBC 6 Music Radio Debut, on The Introducing Mixtape. This is a weekly mixtape of new music hand picked by Tom Robinson and his team. This mix tape is also available to download for four weeks after the airing. "Eromnim3 are a Scottish musical collective "creating soundscapes" they say "for all dreamers". Based around Frank McDade and John P Boyle they're based in the town of Bellshill - whose rich musical heritage includes Teenage Fan Club, BMX Bandits and The Soup Dragons among others. The collective's goal is to collaborate across the media of music, film, photography and video games in order to help showcase the abundance of talent across the west of Scotland. This stunningly atmospheric track was inspired - as its name implies - by an early morning stroll through the Nevada metropolis, and is part of a suite of tracks written and recorded at Peter Gabriel’s Real World Studio. Listening to the immaculate clarity and detail of McDade and Boyle's production you can hear that the money spent on studio rental was a wise investment. The 8 track album is called ‘Realscapes’ and available in lossless digital quality on Bandcamp." 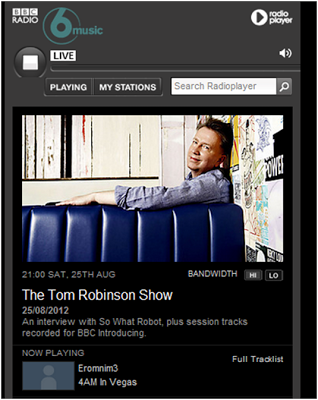 Tom also has his own show every Saturday night entitled 'The Tom Robinson Show', and is where Tom picks his favourite tracks from the mix tape to air. 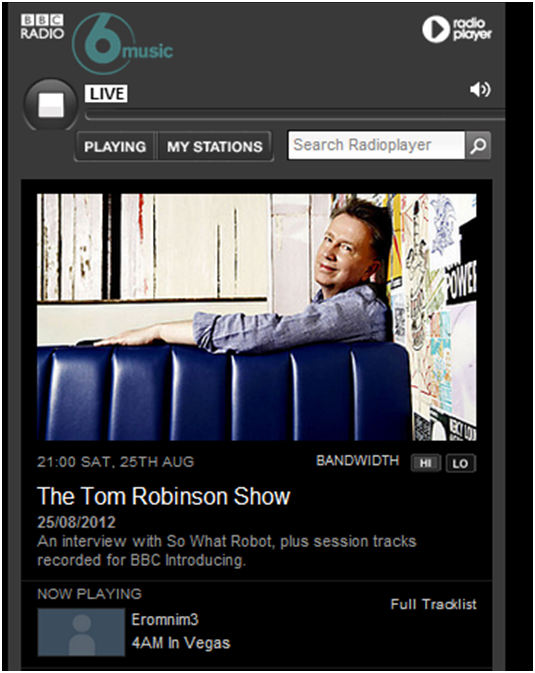 On the following Saturday, 25th August 2012 Tom Robinson played the track that had been included on the mix-tape entitled '4 am in Vegas'. See the screen shot below. Check out Toms site called Fresh on the net, it provides resources, ideas and advice for independent recording artists plus a weekly selection of top tunes handpicked by Team Freshnet and the general public via our Listening Post.